Israeli Apartheid Week (IAW) begins in cities across the United States this Sunday, including at approximately two dozen college campuses. One of the central themes of this year’s events is “pinkwashing,” a shorthand for claims that Israel tries to showcase its progressive record on LGBT issues as a way to whitewash its policies toward Palestinians. 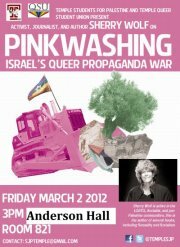 Three universities, Yale, Boston University and Temple, will host events about “pinkwashing” and LGBT issues as part of their IAW programs. A fourth event calls on individuals to rally outside the LGBT Center in New York because the Center refused to host an IAW event last year. Allegations of so-called Israeli pinkwashing have become more prominent in the past several years and gained mainstream attention a few months ago when The New York Times published an op-ed on the subject by CUNY professor Sarah Schulman. She argued that Israel’s acceptance of gays into the military is an “incomplete indicator of human rights” and shouldn’t “blind us” to the Palestinians’ issues. This is a classic straw man argument: No one was asserting that Israel’s record on LGBT issues was the final say on its human rights record. The pinkwashing allegation uncovers something deeply nefarious about the anti-Israel movement: Opposition to Israel is rarely limited to criticism of Israel as it relates to the conflict. Instead, it often becomes an all-out attempt to slander every facet of Israel’s existence and to claim that Israel’s real and laudable achievements are just an attempt to “cover up” the darker truth. Israel’s swift responses to the recent humanitarian crises in Turkey and Haiti were similarly dismissed by anti-Israel activists as an opportunity exploited by Israel to whitewash its record. Even if one disagrees with some of Israel’s policies, Israel has every right to promote its legitimate accomplishments on LGBT rights, including annual pride parades, anti-discrimination laws, adoption rights and, most recently, Tel Aviv being ranked the “best gay city” in the world. Israel deserves and should be entitled to claim credit for a gay rights record that far surpasses most other countries in the world. This preoccupation with LGTB is so superficial and divisive. We watched LGTB parade life-threatening degrading comments to a ministers family in Des Moine, Iowa.They LGTB expressed to the world their true colors to a group of people expressing freedom of speech in a church. This family was in their domain practicing their faith in a way they believe. LGTB was so violent this minister had to close his facebook. This church supports Israel. What makes you so proud to say Tel Aviv is the "best gay city in the world." How sickeningly superficial under such dire circumstances. What a loss for Israel as this alienates once loyal supporters. How abouat some discretion.